I made this meal a few weeks ago when I had friends over to watch Glee. I had a large container of leftover roasted veggies in the refrigerator and at first I was going to serve the veggies over polenta but then, in a stroke of genius, I came up with the idea for this casserole. The girls seemed to think it was pretty good (either that, or they didn’t want to hurt my feelings). Start by making four serving of polenta according to the package directions. Add a handful or two of shredded cheddar cheese to the polenta (mozzarella would work well, too, but I used what I had on hand). 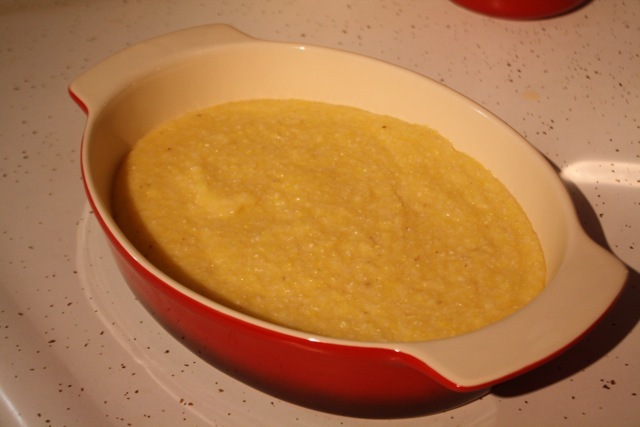 Spread a layer of the polenta on the bottom of a baking dish. Don’t make the layer too thick (you probably won’t use all four servings). Top the polenta with a thin layer of marinara sauce. 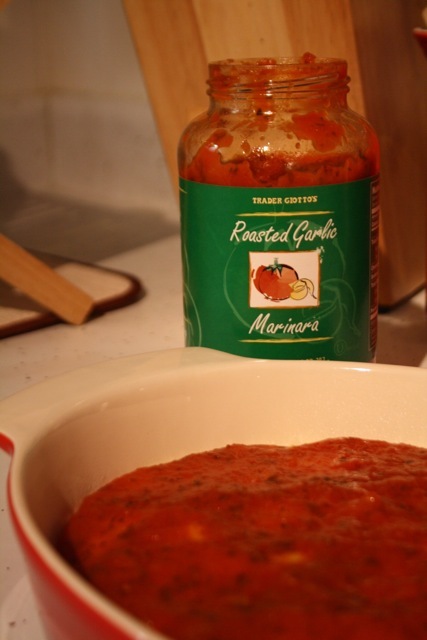 I used Trader Joe’s Roasted Garlic Marinara. Oh my gosh. So good. So fragrant and garlicky. I’m going to have to go back to TJ’s and get more. Stat. 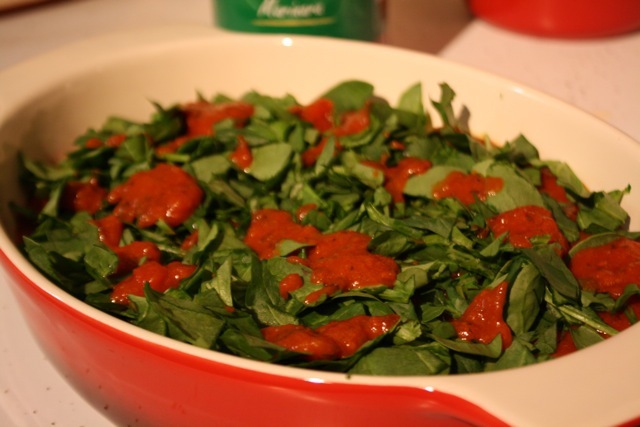 Top with marinara with a few handfuls of roughly chopped spinach and a drizzle of marinara. Top the spinach with a giant pile of roasted vegetables (probably a few cups worth). 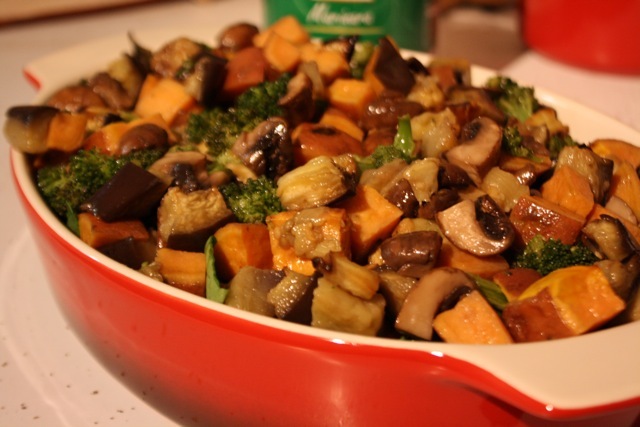 I used sweet potatoes, eggplant, mushrooms, and broccoli. There is a quick explanation of how to roast vegetables at the end of this post. Top the roasted veggies with another layer of marinara sauce. Top the marinara sauce with a sprinkle of extra sharp cheddar cheese (again, you could use mozzarella cheese, but I had cheddar on hand). 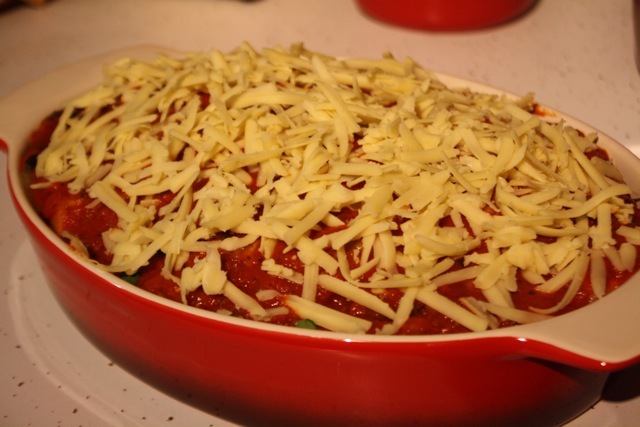 Place the casserole on a baking sheet and bake at 350 until the cheese is melted and the casserole is hot and bubbly. I didn’t get a picture of the casserole after it was served because I was too busy devouring what was on my plate! 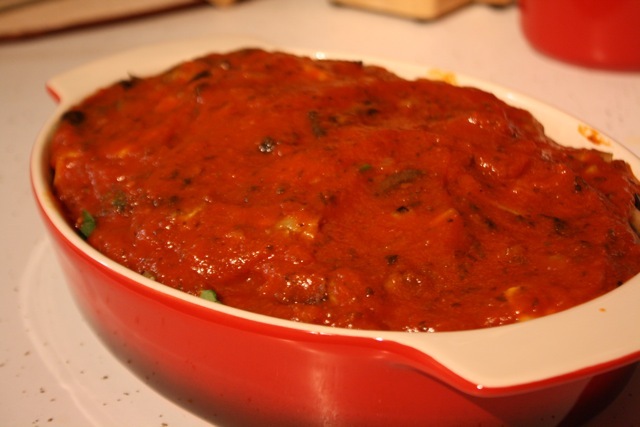 I’m a big fan of casseroles and this one didn’t disappoint – the polenta was creamy and cheesy, the vegetables had great flavor from being roasted, and the tomato sauce tied the two together perfectly. All in all, I would say it was a success and I would be happy to make it (and serve it to guests) again! I’m hoping to do a separate post with pictures of how to roast vegetables, but for now here is a quick explanation. Not all vegetables roast at the same rate, so for this recipe, cook the vegetables in two batches – first the sweet potato and eggplant, then the broccoli and mushrooms. Chop a large sweet potato and a medium eggplant into 1/2-inch cubes. Toss the sweet potato and the eggplant with a drizzle of olive oil, salt, and pepper. Spread the sweet potato and eggplant in a single layer on a parchment paper lined baking sheet. Bake at 450 for 35 minutes or until the eggplant and sweet potato are tender when poked with a fork. Chop a crown of broccoli into equal sized florets. Quarter eight ounces of baby bella mushrooms. Toss the broccoli and mushrooms with a drizzle of olive oil, salt, and pepper. Spread the broccoli and mushrooms in a single layer on a parchment lined baking sheet. 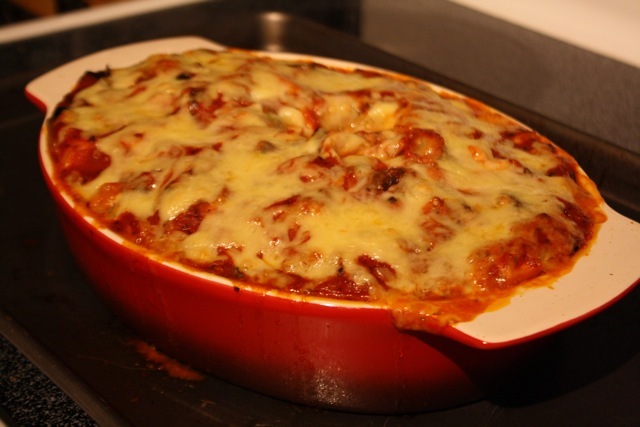 Bake at 450 for 15 minutes or until the broccoli and mushrooms are cooked but not mushy. Watch the broccoli carefully because it doesn’t take much to burn the florets.